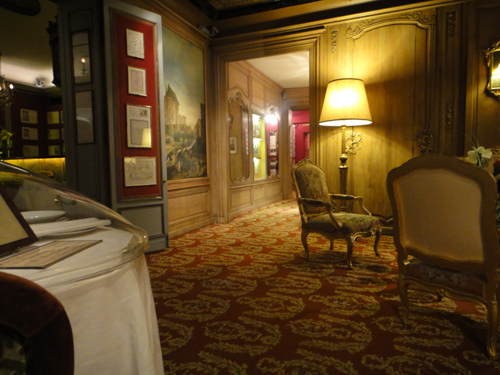 They may have lost a few stars in the past few years, but dinner at La Tour d’Argent in Paris has to be one of the fanciest dining experiences of my life. Granted I’m not much of a foodie and haven’t been to that many fine dining places, it is still quite difficult these days to impress my jaded city girl eyes. 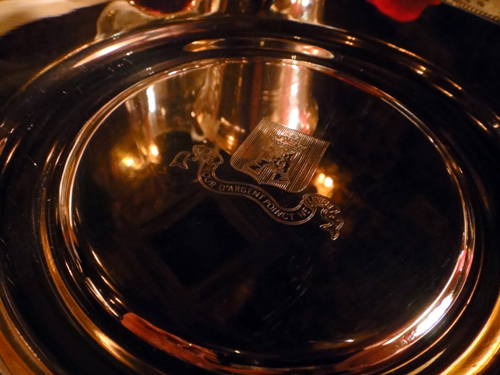 Located along the river Seine, we were quickly greeted by the doorman as soon as our cab arrived and shown into a luxuriously appointed waiting area. 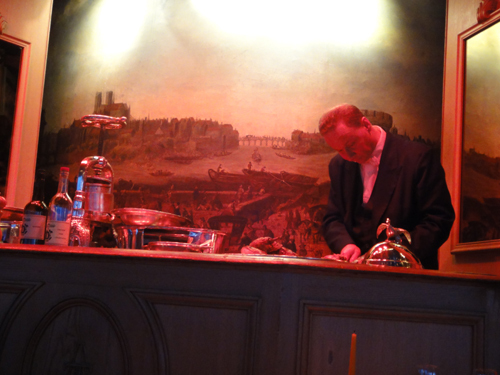 The maitre d’ led us into the bar while we waited for the rest of our party. I was struck by the air of sophistication. Was it ok to order a glass of orange juice? Then they showed us through the mini “hall of fame” where we waited for the liveried driven elevator to take us to the dining area. I noted the presence of JFK and the Empress of Japan. The main dining room on the top floor of the building had a beautiful view of the river Seine and Notre Dame. As the sun set outside, I envied the couples dining by the window seats. How extremely romantic! I must come back some day with my loved one! And of course, everyone was dressed beautifully. If there was ever a time and place to dress up, this was definitely it! 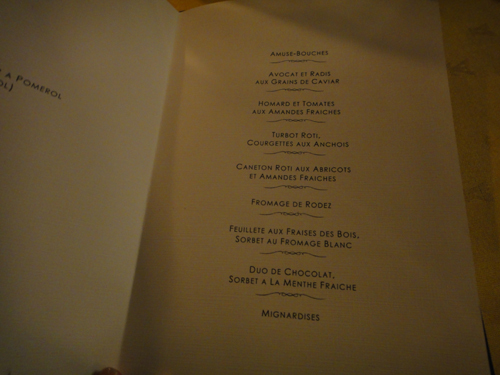 My eyes widened as we were presented with a wine list the size of an encyclopedia- now that is impressive! Since we don’t exactly frequent such establishments, we decided to go for the full tasting menu to ensure that we gave it a good try. I’m not exactly a foodie, so I won’t go into excruciating detail of every dish and how everything tasted, but here is the menu. They are definitely good at is making it a night to remember. Towards the end of the meal, they presented us with a custom made menu of our meal that night, complete with the date, which wine we chose and who our chef was (above). 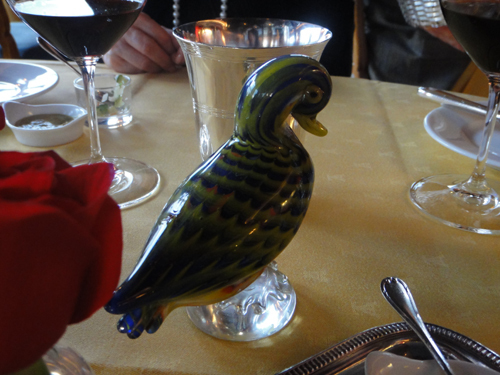 The main theme of the restaurant was definitely the duck. They were everywhere. The home grown ducks are so famous here that we even got postcards with the reference number (since 1890) of the duck we ate that night on it. I ate duck number 1090196! In particular, the pressed duck is most popular. You can see them making it right in the middle of the dining room. First they cut away the breast and thighs. Then they put the remainder of the duck into the presser (the thingy on the left), to squeeze out all the blood, which they then use to make a sauce to pour over the breast and thigh meat. Juicy. One thing I do feel qualified to comment on is the dessert. 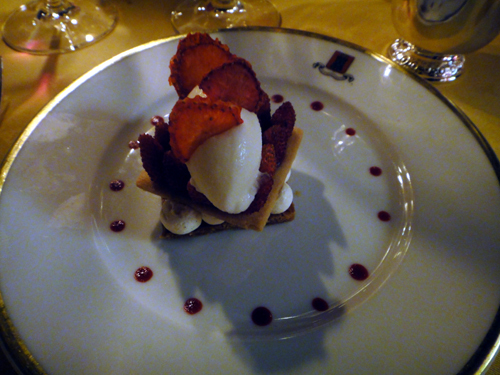 This feuillete aux fraises de bois is the most exquisite thing ever. The slices of strawberry on top are actually sweet and crunchy. You’d thing that the tiny strawberries lined below are sour, but they were surprisingly sweet. Combined with the cream and crust, they were little bites of heaven! Definitely one of the best of its kind that I’ve tried! It was definitely one fancy meal to remember.